Bringing Home Baby: C's New Baby Brother Mama Say What?! | Mama Say What?! C loves being a big sister. And she’s good at it, too! When my daughter was about 10 months old, my husband and I decided we wanted to start trying for a second baby. A two year age difference sounded perfect to us. Since it took us about six months to get pregnant with our first child, we assumed it’d be about the same this time around. However, the way things always go, I got pregnant on the first cycle we tried. We were thrilled and excited, but part of me was scared about having two kids under two. I was a little worried about jealousy issues— my little girl has been an only child her whole life, and certainly has the “Only Child Syndrome.” She gets 100% of mama and daddy’s attention, 100% of the time. She goes on play dates, we go to playgroups and parks and all kinds of kid’s events and we buy her all kinds of cool toys. I knew these things could—and probably would— change when the new baby came along and I was worried about the effect it would have on C.
Would she start acting out? Would she be jealous? Would she think we don’t love her as much anymore? 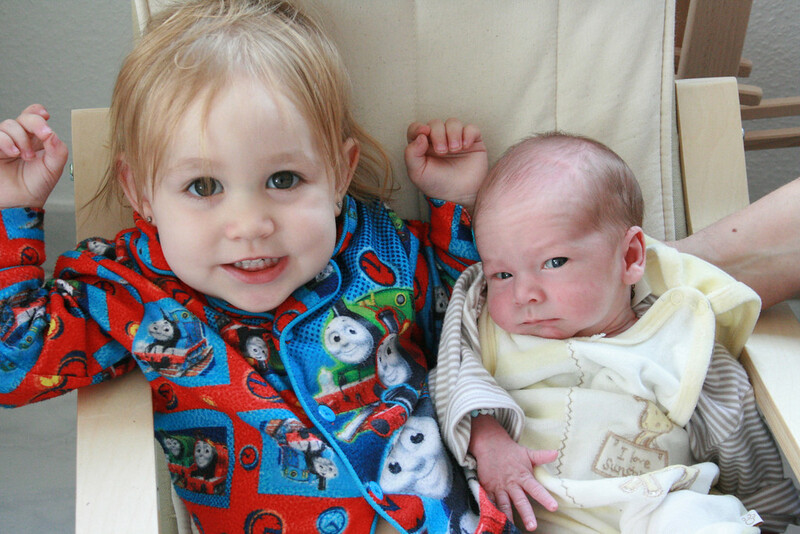 L was born a bit early, so there is an 18.5 month difference between my children. Luckily, we have yet to face many issues. 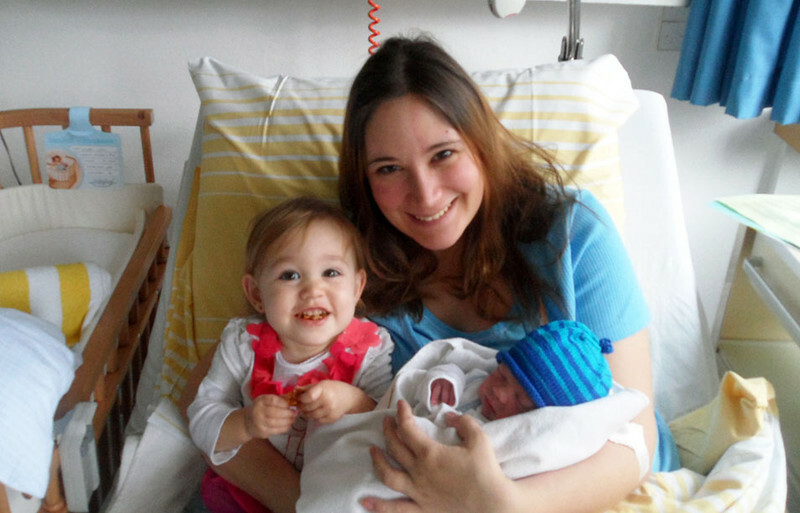 When C arrived at the hospital after L was born, she was really excited to see mama. At first, she wasn’t too interested in the baby lying in the bassinet next to me, but with some gentle encouragement, she started to notice him more. Somehow, she knew she had to be gentle and kind with the baby and did an excellent job of touching him gently. She immediately wanted to kiss his face and touch his fingers and toes. 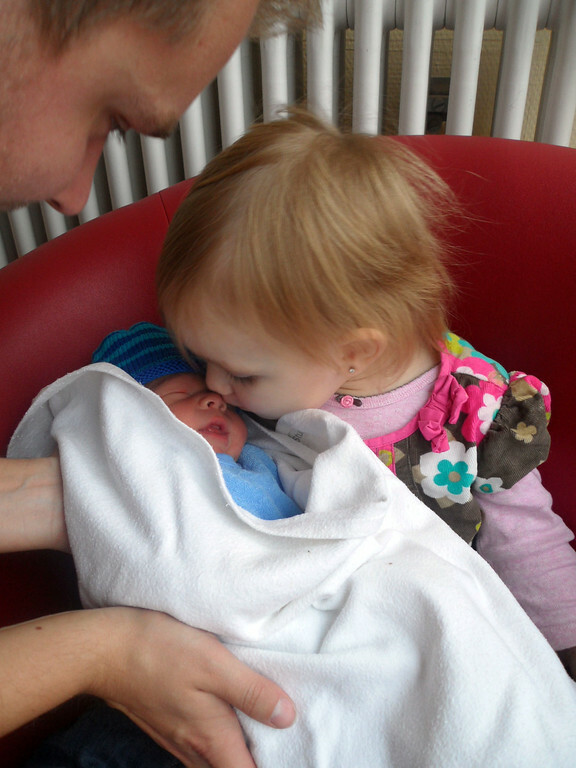 Since we’ve brought L home, C has been a really great big sister. Sure, C wants a little extra attention at times, but for the most part she is proud of her baby brother and loves having him around— even if that means she has to share her mama. Do little girls have some sort of maternal instinct? I don’t know, but I could be convinced. I see it— I love the way C loves to hold her baby brother, and my heart melts when I see the way she stares at him so lovingly. She gently runs her fingers through his hair and she touches his little fingers and toes. 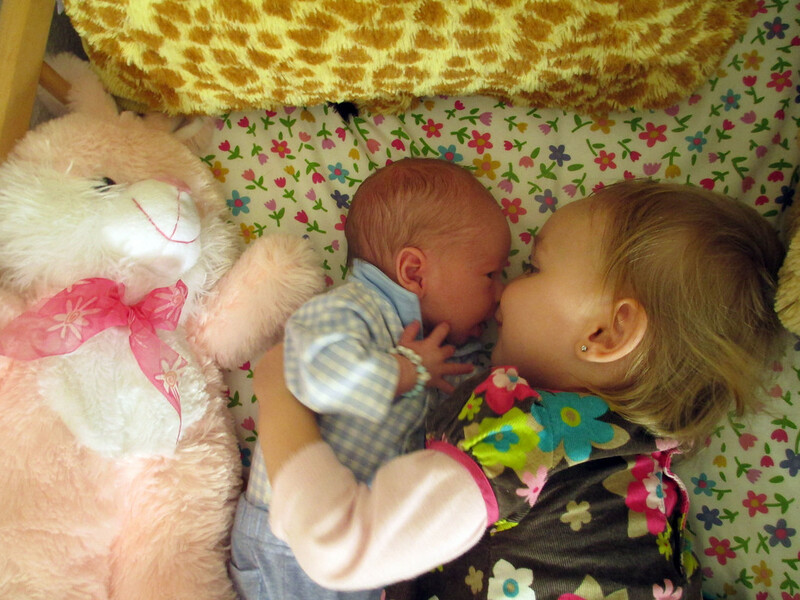 She sings his name when he starts crying to try to comfort him and she “shhh”s him as well. A week or so before L was born, we bought C a book called “I’m a Big Sister” by Joanna Cole. C really enjoys reading it and I think it might have helped a bit with the transition. I believe it makes her feel like a big girl because it highlights the things she can do that the baby can’t (like eat pizza and ice cream!). It also talks about how she is still special, even though there is a new baby in the house. With the addition of our newest little one, we’ve pushed the whole “you’re a big girl now!” thing with C, too. We bought her a “big sister gift”— her very own bicycle— and we talk about what a big girl she is when she gets to ride it. We’ve also given her a bit more “toddler responsibility.” She gets a sticker for “brushing her teeth like a big girl” every day. She is allowed to drink out of a “big girl cup” now instead of a sippy cup and we took off a bar on her high chair, converting it to a booster chair, so she can climb in and out of it all by herself. She loves these things. This is not to say it’s been easy having two kids under two. For example, take our day trip when L was about three weeks old. My husband was still home from work and so we spent an entire day out of the house; first we toured a chocolate factory, then we toured an old castle, and then we stopped at an outlet mall on our way home. It was a fun day, but it was a long one. On the hour-long ride home, my colicky three week old screamed most of the time. My overtired 19-month-old was throwing a fit because the blow-up ball she was playing with had dropped on the car floor. (Even though I had already picked it up and gave it back to her.) My husband, who was driving, was trying to distract the kids by singing a song. In the passenger seat, I had my arm twisted around the headrest trying to reach backward to soothe baby L with the pacifier. Yes, all of this was going on at the same time. Can you picture how loud and frustrating this car ride was? But for the most part, it’s gone well. We’re so lucky to be parents to such awesome children. Added by Cassie W. on May 19, 2013.
thank you so much for sharing! we have #2 due this winter and my son will be 21months so it was encouraging to read a similar situation!